Sometimes called flow of funds. Cash flow is the amount of cash generated by a company and is taken to be an indication of its ability to pay a dividend and of its future financing requirements. 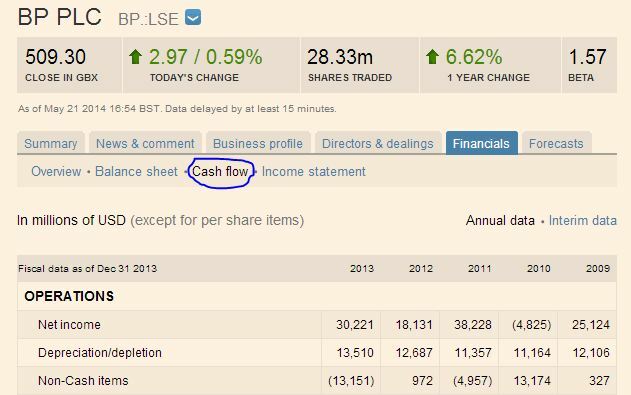 When a company produces more cash than it uses, it has a positive cash flow; the opposite is a negative cash flow. Cash flow at all levels of a company's business, whether from operations, financing activities or investments are detailed in a company's cash flow statement (sometimes called funds flow statement). Cash flow from operations is normally the bottom line profit plus depreciation and other non-cash charges. In the US, this is sometimes called cash earnings, from which one can calculate cash earnings per share. In contrast to a balance sheet statement, which gives a snapshot of a company's assets, liabilities and shareholders' equity at a given moment in time, a cash flow statement shows inflows and outflows over a given period of time. The bottom line of a cash flow statement shows the net increase or decrease in cash for the period. In general, cash flow statements are divided into three main parts which show flows from operating activities, investing activities and financing activities. In May 2014, a Lex note looked at the practice of using ebitda (earnings before interest, tax, depreciation and amortisation) as a proxy for cash flow. However, relying on the ebitda figure from an income statement can mislead, the post argued, because it ignores critical uses of cash that appear elsewhere – for example, capital spending, changes in working capital and deferred revenue.